THIS RESTAURANT IS CHANGING LOCATIONS. OC's first enomatic wine tasting room offers one-ounce pours of wines as well as beers, food and private party space. : THIS RESTAURANT IS CHANGING LOCATIONS. Entrepreneur Julie Lim took an aging liquor store by the airport and completely transformed it into a sophisticated wine tasting bar. 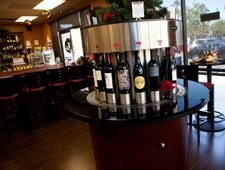 Yes, OC Wine Mart is a modern liquor store, but it is also OC’s first enomatic wine bar. Buy a card at the counter and then enter the wine tasting lounge. Choose the wines you wish to taste and insert the card into the enomatic machine and place your glass under your desired wine bottle for a one-ounce taste. Lim and her sommelier recommend good picks and can also bring a plate of artisanal cheeses, meats, fruit and nuts for an additional charge. Some come to this business district at night to celebrate birthday parties or special occasions. OC Wine Mart also ships wines nationwide via online shopping.